Seattle’s Bumbershoot Festival has always been our favorite way to bid adieu to summer. With a variety of outdoor and indoor stages, a great comedy, arts and spoken-word lineup in addition to an increasingly fantastic musical lineup, all in the shadow off the Space Needle, what’s not to love? Last night, the Bumbershoot crew announced the lineup for this year’s festival, and we couldn’t be more pleased. With some local favorites highlighted alongside some more mainstream all-stars, this year’s Bumbershoot is sure to be another favorite. In other good news, three-day passes are only $120… that’s only $40 per day to see more music than you probably do all year! We’d say that’s a pretty great deal! 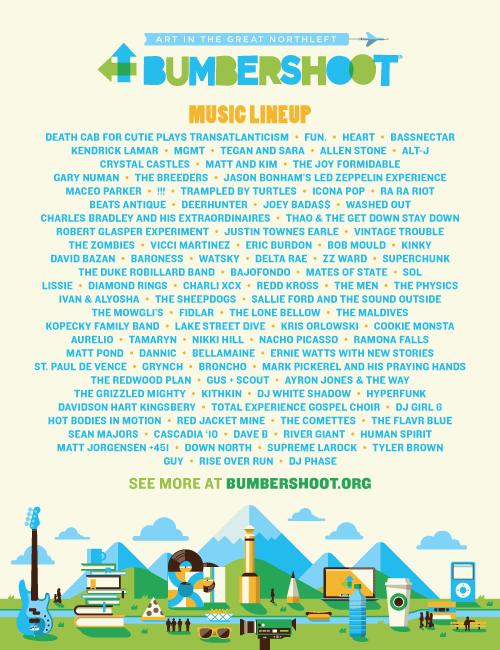 The full lineup is below, and be sure to check out bumbershoot.org for more details.